The status of thw White group is unsettled. 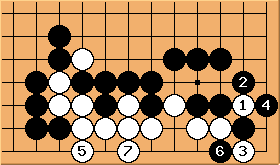 If White plays first, White lives; and if Black plays first, White dies. If White plays first, there are two ways to live. 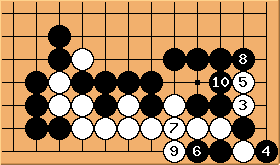 Using the special properties of the corner, White plays and away from the corner. If tries to destroy the eye, then connects, and captures Black with a connect-and-die with and . Since White captures three stones, White lives. 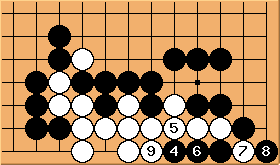 If makes a placement instead, then the descent at allows White to live with a seki. White can cut at , atari at before making the play at . If the outside is all Black territory, then this is better for endgame reasons. If , then connects. 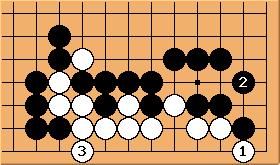 Black finds that connecting at a is not possible. is not a method to live. The throw-in at kills. White's strongest resistance is at and . 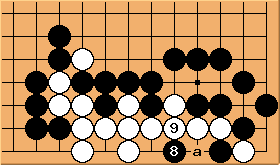 However, can atari, so the two Black stones chain at the bottom is capture two, recapture one which curiously gives Black an extra liberty in the capturing race, so White dies. Rich: Doesn't white still have a direct ko? If Black first, there are many ways to kill. Two ways are shown here. After White does not have enough room to live. Even if White had a stone on a, she would have, in effect, only 6 stones in a row on the second line. See eight live, six die. 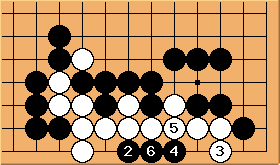 kills by preventing the connect-and-die as shown in the White plays first diagrams. Practically, this is usually better than Method 1 because it affects the outside more. Chris Hayashida: In order to support this, someone needs to write-up a diagram for Black to play and kill. unkx80: Thanks, I was lazy. George Caplan: I am still learning to diagram, but if the "not a method" diagram is correct, then Black 2 in the diagram must kill as Black 1 in a new diagram. unkx80: Is there such a convention? George Caplan: Not a convnention, but the message of the diagram is that, essentially, White has not improved his position, and can still be killed, so the same move should kill the group without White's first move. The best answer has been posted, kill with the most outside move possible. unkx80: You mean here? Then lives (reading exercise for you). George Caplan: No. 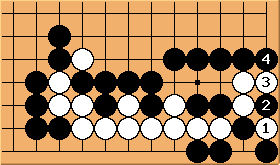 My comments were relating to the request for a diagram showing how White dies if Black plays first. Your problem has White playing first. 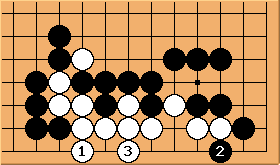 Looking at your diagram of the position, White dies if Black plays first, at either 2 or one to the left of your 1. 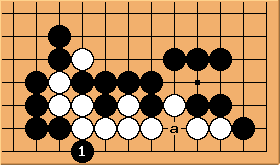 If White plays 1 as you suggest, the refutation has already been posted.